Mr. K’s team of two 300 B’s and one B powered Dodge annihilated the best the factory teams had to offer. They won 22 of the first 29 races and had the longest winning streak in NASCAR history: 16 straight races. After losing the race that ended the streak, Mr. Kiekhaefer showed the stuff he was made of. He stopped by and congratulated the winning car’s crew on their pit work. A gentleman he was. Complacent he was not. A few races later, after the rules were juggled to give the competition a chance against Mr. K, he showed up at the technical inspection with a list of his competitor’s violations. He pointed out that he was not allowed to use these modifications, but his competitors were. They said, “That’s about right.” He had to walk back and tell his team to carry on. 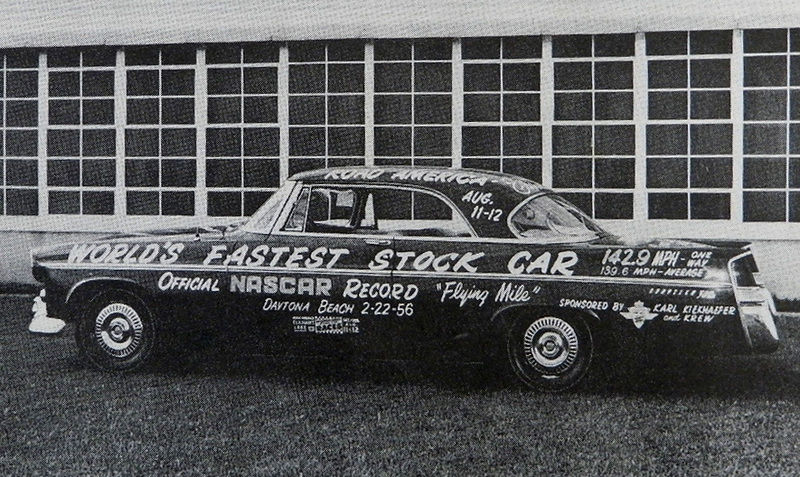 Buck Baker, after Tim Flock quit, carried on to easily win the NASCAR championship. He and Carl got on very well. Carl gave Buck steak instead of hamburger and Buck gave Carl his second championship. Mr. K loved racing and hated to lose. He got a little tired of people saying that “Chrysler” won the races rather than the “Mercury Outboard” cars won. He bought one Ford and built it up for just one race. He put his best driver, Buck Baker, in his Ford and tried to beat the Ford factory teams. Everyone thought he was crazy. He won, of course. After the race the head of the factory Ford team started hanging around the car and answering questions. Mr. K blustered over and told the curious onlookers that the Ford team and that man didn’t have a darn thing to do with the winning car. After that, what new mountains could Carl Kiekhaefer see to climb? He had succeeded beyond his wildest dreams. Running nearly stock Chrysler 300s and 300Bs, he had beaten over and over the somewhat more modified Ford, Chevy, Pontiac, and Mercury factory cars. The battle between makes never materialized. The battle was between two giants: Detroit and Carl Kiekhaefer. Against all odds, Carl had won. Small wonder that he hung up his racing cap for good and left. I would like to have ridden around in his shirt pocket during one race in those golden glory days. Everyone that watched him saw him in a fierce uncompromising competitor. They recognized a rare flame that frightened some and fascinated others. People that try to write about that fire always fall short. After twenty years armchair racers read in awe of his determination, expertise and sportsmanship. We should all be thankful he chose to plaster “Mercury Outboard Motors” on the best car available: the Chrysler 300. You can read more about Carl Kiekhaefer in Russ Hamilton's book Full Jewelled .